Nowadays, there is a huge demand for metal roofs due to its increasing popularity. Though, they cost much more than traditional roofing, they can last longer and requires very little maintenance. Corrugated metal roofs are economical as the rate of the materials, transport and installation involved is significantly lesser. Standing seam metal roofs on the other hand could be two or three times costlier. 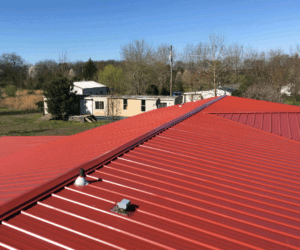 The materials used in the standing seam could withstand more stresses when compared to the corrugated metal roofs. This is because the standing seam roofs are thicker and you need to take this difference into consideration. Corrugated roofs are usually coated with zinc so that they could resist rust and corrosion. Standing seam roofs are made from a super-galvanized steel “Galvalume”, Hence, they offer better resistance against rusting and corrosion. Standing seam looks much more formal than corrugated metal roofs and both are aesthetically pleasing in their own way. They both can last for many decades. But the corrugated metal roofs have exposed fasteners that are exposed to the environment and it is best to inspect them regularly. Standing seam metal roofs have concealed fasteners and do not require inspection. However, they both are considered as good for the environment and remain strong during extreme weather conditions like high winds, lightning, fire and hail.